A photo of SCP-2297 taken during testing. Special Containment Procedures: SCP-2297 is to be magnetically suspended in a Safe-Class storage locker that is not parallel or perpendicular to the floor of the room in which the storage locker is kept. This storage locker must be assessed for damages once every 24 hours. If the Safe-Class storage locker has been rendered inoperable and/or unsuited for the containment of SCP-2297, an on-site supervisor must be notified immediately. Description: SCP-2297 has the appearance of a BOSCH RTH6450D1009 5-1-1-Day Programmable Thermostat. Of note is SCP-2297’s unique internal composition. Inside the casing of SCP-2297 rests a fleshy interior comprised of various organs whose functions remain mostly unknown, though visual comparisons liken them to the lungs and kidneys found in humans. The flesh itself is highly resistant to mechanical sampling using conventional tools, thus the use of projectional radiology has been necessitated. These tests were able to reveal a system comprised of valves and flaps responsible for the intake and output of oxygen. A proposal to use more invasive forms of sampling is currently awaiting approval. SCP-2297 will remain in a dormant state indefinitely so long as it does not rest face-up on a flat surface. When mounted or placed on a flat surface, SCP-2297 will activate and display one of several messages in the following format: "[X] IS NORMAL". These messages pertain to the anomalous conditions that will be exhibited within the room SCP-2297 is activated. Determined by the displayed message, the environment and temperature of the room SCP-2297 occupies will be altered drastically. These effects steadily increase in intensity upon activation of SCP-2297 before instantaneously dissipating four minutes after activation. 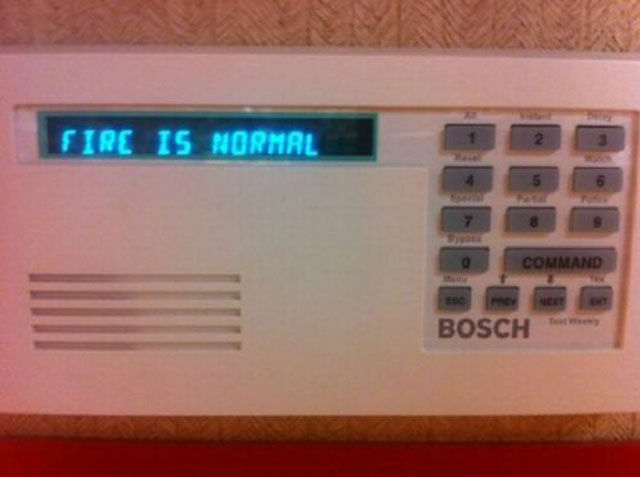 After SCP-2297 has carried out a full, uninterrupted four minutes of its chosen effect, it functions as a normal thermostat until removed and reactivated. Those located within the same room as SCP-2297 are not concerned with the effects of change in temperature and environment, and do not believe themselves to be in any danger. The messages and their corresponding effects documented thus far can be found in Addendum-2297-1. SCP-2297 only affects the specific room in which it was activated. SCP-2297 appears to self-define a "room" as any area that is enclosed by walls, a floor, a ceiling, and a distinct structural element dividing the room from the rest of the structure. These "divisions" can range from doorways to a change in elevation such as a flight of stairs or a ladder. Repeated testing in a singular room setup yielded many different results and led to the conclusion that SCP-2297 determines for itself what is and what is not a room. SCP-2297 also recognizes if it has been placed in an outdoor area, and will not activate when placed outside. Further testing in this environment is low-priority due to the many precautions necessary for such a potentially dangerous experiment. SCP-2297 was recovered at ██████████ in ███████ after the ██████ Conference, an event notable for being a gathering of scientists dedicated to the preservation of the environment. An agent embedded within the local police force notified the Foundation of the presence of anomalous activity after being dispatched to the scene of the incident. All ███ attendees of the ██████ Conference were found dead in conference room 417. The cause of deaths were initially labeled as respiratory failure from smoke inhalation and/or self-immolation, but were later determined to be immolation by SCP-2297. Although SCP-2297 has some notable cognitive abilities based on previously conducted research, it does not seem to have any reason for or predictable order in which it carries out its anomalous abilities at this time. Effect: The average temperature of the room increased from 23 degrees Celsius to 1113 degrees Celsius over a period of 4 minutes. Results: A singular D-Class subject indicated no signs of discomfort or pain as his body was burning. He did not display any symptoms of respiratory distress or succumb to respiratory failure before expiring from fire-related injuries despite the room having purposefully inadequate ventilation. Effect: The average temperature of the room decreased from 23 degrees Celsius to -195 degrees Celsius over a period of 4 minutes. Results: A singular D-Class subject reported no changes in movement capabilities, temperature, or comfort for the entire duration of the test. Three D-Class personnel responded similarly, the only difference of note being that the D-Class huddled together for warmth in what would be the final stages of profound hypothermia, despite all D-Class claiming otherwise. All test subjects survived testing due to the short exposure time, as predicted. Effect: The average temperature of the room increased from 23 degrees Celsius to 36 degrees Celsius over a period of 4 minutes. Results: Testing was inconclusive. Repeated testing has resulted in subjects who claim to be either melting, freezing, or simply dying. A test conducted with several D-Class in the same room results in each subject reporting a different temperature and condition. Despite their claims the D-Class were never observed to be suffering from any of the described conditions and were fine once removed from the testing room. Evaluation to determine whether or not the "simulated" pain inflicted will have long-term psychological effects on the D-Class is still underway. Effect: The average air pressure of the room decreased from 100 kPa to 20 kPa over a period of 4 minutes. Air inside the room condenses, producing a fine mist inside the test chamber. Results: Researchers noted increased heart rates and lower blood circulation in the D-Class subjects; a post-test autopsy on one subject revealed a severe accumulation of fluids in the lungs. Despite this, all D-Class continued to report that they "feel fine" during testing and none succumbed to the effects of the lowered air pressure until after leaving the testing room. Effect: The specific humidity of the room increased from an average of 7.6205 g/kg (44%) to a specific humidity of 37.434 g/kg (214%) over a period of 4 minutes. Results: All D-Class tested were observed to have difficulty breathing, with two of the D-Class hyperventilating mid-test. Despite the observed hyperventilation, both D-Class were able to interact and communicate with other D-Class in the test chamber. When researchers requested a response from the affected D-Class they either refused to communicate or were incapable of doing so. Effect: The environment of the room changed from a controlled temperature of 23 degrees Celsius, consistent air pressure and humidity to one of █████████████████, with averages of ████ and ██. Of note were the runic markings that appeared on the floor and ceiling, as well as the coating of ████████████ that formed on the walls of the test chamber. Results: [EXPUNGED], with all D-Class quoting numerous related texts found in Divine Comedy. After 4 minutes of continued ███████████, all D-Class underwent a Type Σ-04 planar shift. All D-Class personnel involved are to be considered lost and unrecoverable. Research into what caused these results, and if they can be replicated for further study, is ongoing.